Every month, I receive a collection of trade journals that layout the industry trends, RV related business articles and new products. I am always on the lookout for products that we can carry on our website, that truly solve a problem and are head and shoulders above the competition. One of the most often asked questions at my RV Maintenance Seminars is "How can I get my Black and Grey Tank Level gauges to read correctly? My reply reflects upon what the RVer should do to reduce inaccurate readings: Dump upon arrival, use tank flushers, throw a bag of ice cubes down the toilet and drive to break up the waste and tissues caught on the sensors, use chemicals and so on. At the same time I recognize that the problem is really a tank sensing system that has a weak link: the in-tank sensor. For those that are truly frustrated, the correction has involved spending hundreds of dollars to install an external monitoring system "that the RV Maker should have installed at the factory" to quote the often heard phrase. Along came Horst Dynamics with Miracle Probes. Simply replace the existing sensor, or add a probe nearby, and always have correct level readings. The Grey water probe when installed, is about 1-1/2" from the tank wall and has a spiral head to fully contact the liquid and better conduct electricity. A narrow shaft covered with Teflon tubing is connected to the plastic body and the other end is connected to the monitor wiring. Everything is completely insulated except the head. Teflon is a non wetting material and is self cleaning so waste will not stick to the probe. Contrast this to the standard sensor mounted just off the wall with a screw in a plastic bushing. Residue on the tank wall and slight current leakage will give false readings. The Black water probe has a "roof" over the probe wire so tissue cannot touch the probe. The roof is orientated upon installation so that it is on the top. Miracle Probes are sold in tank sets of 4 probes and can be installed by the Do-it-Yourself RVer with access to the holding tank end with the monitor wiring. 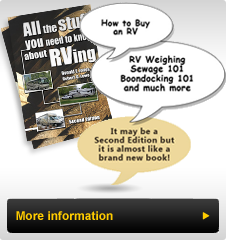 Alternatively, your RV dealer can install the probes for far less than the cost of a new monitor system. In a future TechTip, I plan to detail the installation of them on our Bounder. Check out the Rally Specials Page on our Website and see how inexpensive these probes are. Order and install them and you will never have to guess at your holding tank levels again.